This one day intensive training will focus on mastering your CLASSIC eyelash extension skills. You will leave with confidence in your skill set and the ability to charge more for your services because you will be delivering high quality services to your clients each and every time. Increase your client retention and word of mouth will begin to spread like wildfire. We will work on lash techniques, making your products work for you, and lash retention. We will also focus on increasing client retention and reducing no shows and last minute cancellations, along with bonus business tips. 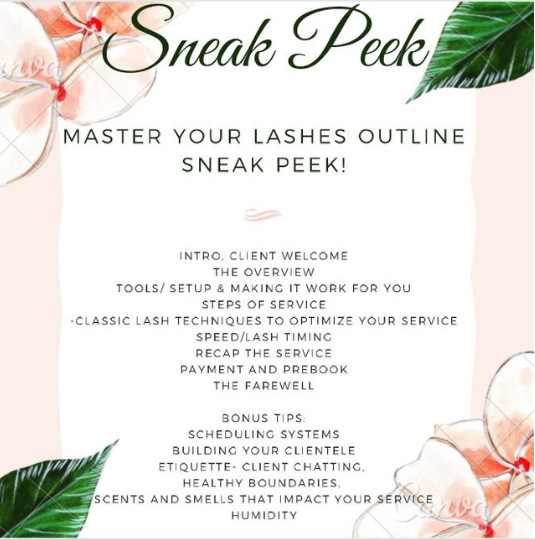 Lunch, snacks and beverages are provided as well as a Lash Kit valued at over $100. Total cost for class is $299. Payment plans available. Message for payment plan details or any additional information.